The most recent round of white-tailed deer antler measuring conducted by the S.C. Department of Natural Resources revealed 222 new records, including one Boone and Crockett qualifier. Each spring S.C. Department of Natural Resources (DNR) Wildlife Section personnel make a concerted effort to measure deer racks throughout the state, with a major session during the Palmetto Sportsmen’s Classic in Columbia. Of the 569 sets of antlers measured this spring, 222 met the minimum score for entry on the state records list including 213 sets of typical and 9 non-typical racks. According to Charles Ruth, Deer/Wild Turkey Program coordinator for DNR, although not as strong as the past couple of years, the number of successful entries into the records list this year is the third highest number of entries in the last 10 years. Although all of the records were not taken during the 2013 season, 182 were taken during the 2012 or 2013 season. Racks must score a minimum of 125 points typical or 145 points non-typical to qualify for the South Carolina state records list. 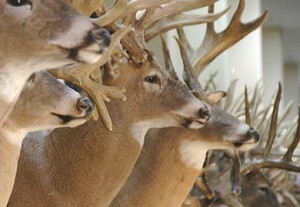 Records are based on the Boone and Crockett Club scoring system, which measures the mass and symmetry of deer antlers in two categories—typical and non-typical. The top typical buck was a 162 7/8 inch buck taken by Gary Walls in Orangeburg County in December of 2009. Walls’ buck qualifies for the Boone and Crockett Club’s Three Year Awards Period List and is 18 among South Carolina’s all-time typical deer. The second highest scoring typical was a 159 3/8 inch Laurens County buck taken by Ricky Brooks last October. Netting 167 4/8 points, the top scoring non-typical buck was taken by Tony Blackwell in Oconee County last December. South Carolina’s deer herd is in good condition, and after many years of rapid population growth the herd stabilized in the mid-1990s followed by a decreasing trend since about 2002, according to Ruth. Statewide population estimates put the deer herd at about 750,000 animals with an estimated harvest of approximately 225,000 each of the last few years. Although the total deer harvest in South Carolina has been down the last few years, indications from the antler records program are that deer quality remains good. This would make sense because fewer deer in the population would benefit from increased nutrition. Kershaw County was this years’ top producer of State Record entries with 15 followed by Aiken County, which had lead the state the 3 previous years, with 14. Other top counties included Orangeburg (10), Calhoun (10), Fairfield (9), and Dorchester (9). These results come as no surprise as these counties have historically produced good numbers of record entries. As far as all-time leaders at the county level, Orangeburg County remains at the top with 457 sets of antlers on the list. Rounding out the top five counties Orangeburg is followed by Aiken 435, Fairfield 264, and Anderson and Colleton each with 246. On the other hand, if you account for the size of the county the top counties per unit area of harvest are Anderson, Abbeville, Orangeburg, Allendale, and Aiken. South Carolina hunters should recognize that harvesting potential Boone and Crockett bucks is not a common occurrence anywhere in the country. This is particularly evident if you consider that there are only about 13,000 white-tailed deer records listed by Boone and Crockett, which includes entries dating to the 1800s. Similarly, the harvest of deer in the United States in recent years has been about 6 million per year. Essentially, the average hunter stands a better chance of being struck by lightning than harvesting one of these record deer. As for the South Carolina Antler Records List, about one in every 800 bucks harvested makes the State Book. Currently 6,389 sets of antlers (6,147 typical and 242 non-typical) are included on the South Carolina antler records list.